Remember those Vegan Banana Nut Muffins I made recently? If not, you should make them. Like, STAT. Well, as I was writing the post, I realized I had yet to make my second favorite flavor of muffin in gluten-free form. That had to change, obviously. Spoiler alert: It totally worked and they’re totally delicious. This is another 1-bowl recipe! It also requires simple ingredients you likely have on hand right now. The base of the batter is flax eggs, applesauce, coconut oil, and almond milk. Good news! These muffins are naturally sweetened with maple syrup and coconut sugar. To keep them gluten-free, I used a mixture of gluten-free oat flour, almond flour, and my DIY Gluten-Free Flour Blend. 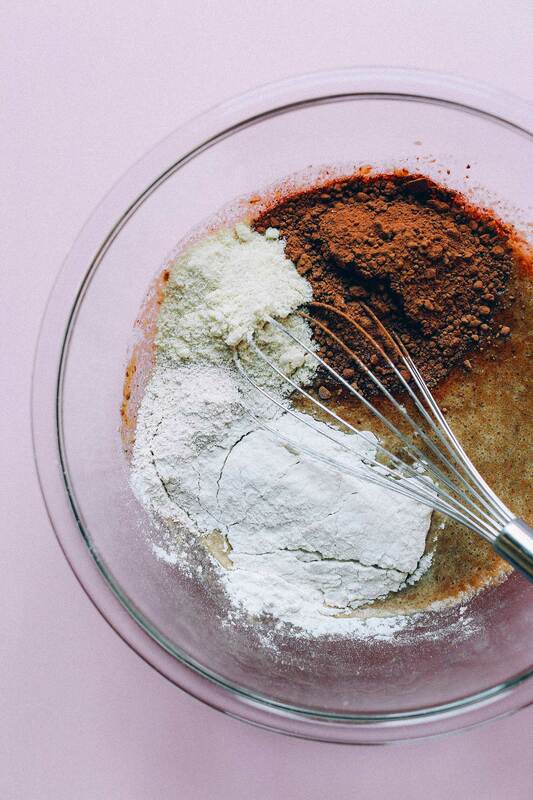 This is my go-to blend in most baked goods for keeping them light, airy, and tender. The chocolate flavor comes from cocoa powder and vegan dark chocolate chips (my favorites being Enjoy Life or Trader Joe’s). I suggest a modest amount of chocolate chips in the recipe, but then I went ahead and topped them with another hefty handful before baking. Because chocolate is life. These muffins rise beautifully and then fall a bit when they’re cooling. But not to worry! That doesn’t mean they’re not perfectly fluffy, tender, and crumbly on the inside. And I love how the top forms a bit of a crust while the inside remains super moist and chocolaty. Total swoon-fest. You’re gonna want, like, three of these with a glass of almond milk immediately. Trust me. These would make the perfect healthier treat to accompany a breakfast such as a scramble or a smoothie. They would also make a lovely afternoon snack or dessert. 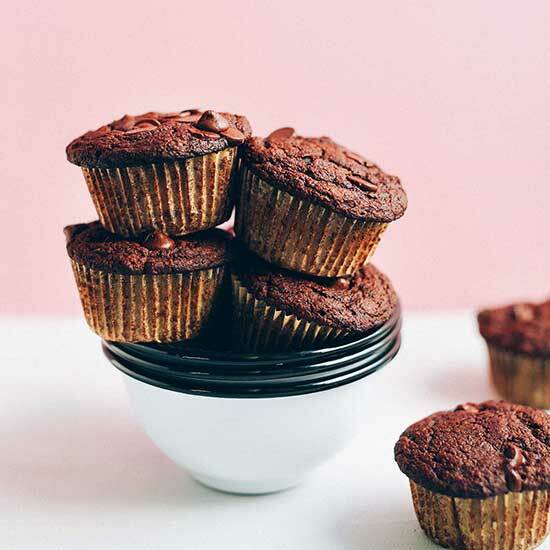 Tender, fluffy, vegan chocolate chocolate chip muffins made with in 1 bowl! Naturally sweet, insanely delicious, and so easy to make. Preheat oven to 375 degrees F (190 C) and line 9-10 muffins (amount as original recipe is written // adjust if altering batch size) with paper liners (I prefer these, as they don’t stick to the muffins). Add applesauce, maple syrup, coconut sugar, baking soda, baking powder, and sea salt and whisk again. Then stir in the melted coconut oil and almond milk and whisk to combine. Add cocoa powder, gluten-free flour, oat flour, and almond flour and whisk until just combined. If the batter appears too thick, add a touch more almond milk. But it should be quite thick and NOT pourable – rather scoopable. Lastly, stir in chocolate chips. Then divide batter evenly between muffin tins, filling all the way full (should be enough for 9-10 // amount as original recipe is written // adjust if altering batch size), and top with a few more chocolate chips (optional). Bake for 22-28 minutes or until a toothpick inserted into the center comes out clean and the edges appear dry. Let cool for 5 minutes in the pan. Then remove from tins and let cool on a cooling rack. Texture is best when cooled completely. Will keep covered at room temperature for 3-4 days or in the freezer for up to 1 month. *Nutrition information is a rough estimate calculated without additional chocolate chips (on top). *Recipe adapted from my Fudgy Beet Double Chocolate Chip Muffins. If I don’t have oat flour can I use gluten free oats or more almond flour or gluten free flour blend in place of that? Thanks! Hi Heather, we haven’t tried it that way, but think it could work! Perhaps almond flour would work a little better? If you give it a try, we would love to hear what you think! Thanks! Thank you so much! I used more almond flour (exact amount) instead of oat flour and they turned out to be SO good!! Also PS I don’t know why, but mine also turned out to have fluffy “muffin tops”, rather than flat like in the pictures, which was unexpected and I loved it! And I only replaced the oat flour with almond flour, as well as exchanging chocolate chips for dried cranberries! I made this and opted for ground walnuts instead of almonds, and banana instead of apple sauce, and it turned out deliciously scrumptious! I really want to love these and was pumped after reading the reviews. Mine came out in my opinion- overly “cakey” not super moist or fidget as I hoped. Here’s the changes I made, which were all ok’d in the comments. Where may I have gone wrong?! I used regular choc chips vs dairy free ones. Hi Melissa, sorry to hear these didn’t turn out as you expected. We wouldn’t think subbing the chocolate chips would contribute to a different texture, but any of the others could potentially change it- perhaps just one change would be okay but not all together? Hope that helps! I made these with my two toddler daughters this morning. 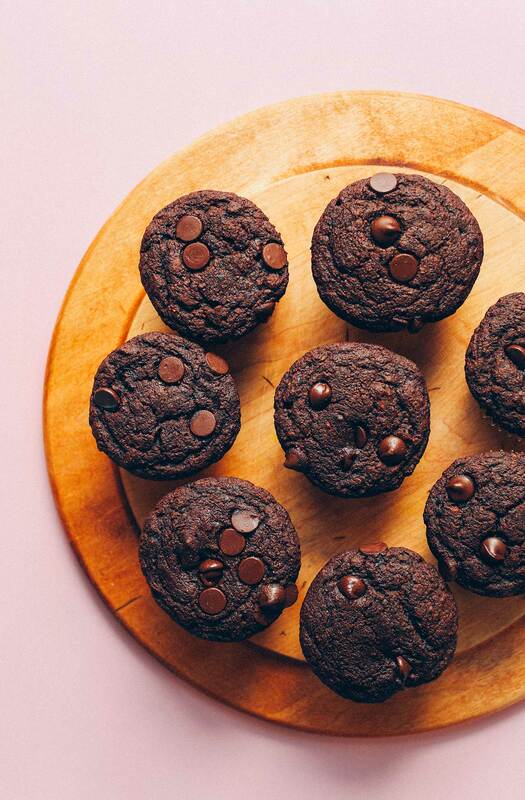 They dubbed them “super duper delicious chocolate muffins”!! I subbed honey for maple syrup and used 73% dark chocolate bar chopped up instead of vegan chocolate option; but followed all other ingredients and directions as written. Mine had gorgeous round tops and tasted so good! Thank you! Time and time again your recipes delight us and impress us with the vegan/gluten free options that don’t sacrifice a lick of yumminess! You are the best!!! 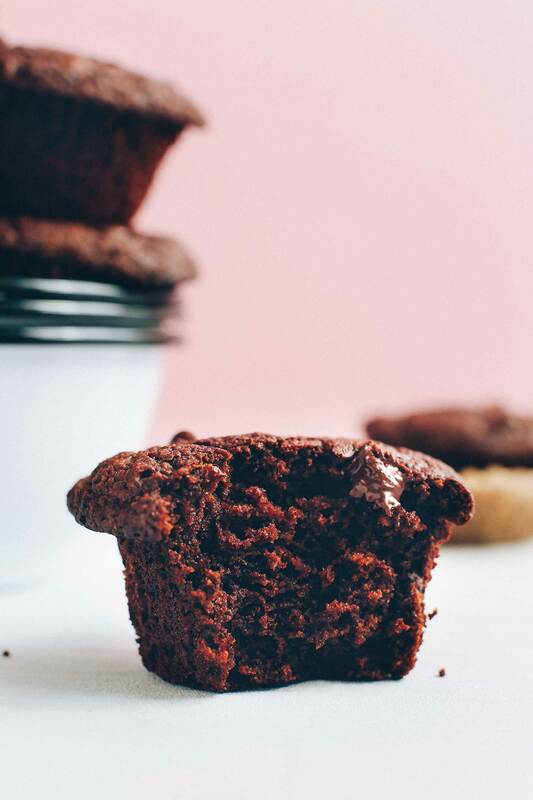 I needed a new double chocolate muffin recipe that was gf and vegan. They turned out amazing! We also love love love your chocolate fudgy brownie cookies!!! Great! Thanks for sharing, Liz! The first ever successful GF vegan baking I’ve ever made. Thank you sooo much! My only sub was banana in lieu of apple puree because it was what was on hand. Committing this recipe to the brain book. Hi I would like to know if I can use one flour for both types of flour in the recipe? If not gluten-free, you could try subbing regular whole wheat flour for all of the flours. Scan the comments above for more tips. Let us know if you give it a try! Perfect cupcakes! Fluffy, moist and not overly sweet. I usually make them with vegan ganache icing (chocolate chips, coconut oil and almond milk) . I didn’t have any of the minimalist gf flour blend left, so I subbed bob’s red mill 1:1 gf flour and it turned out great! Yay! We are glad you loved them! 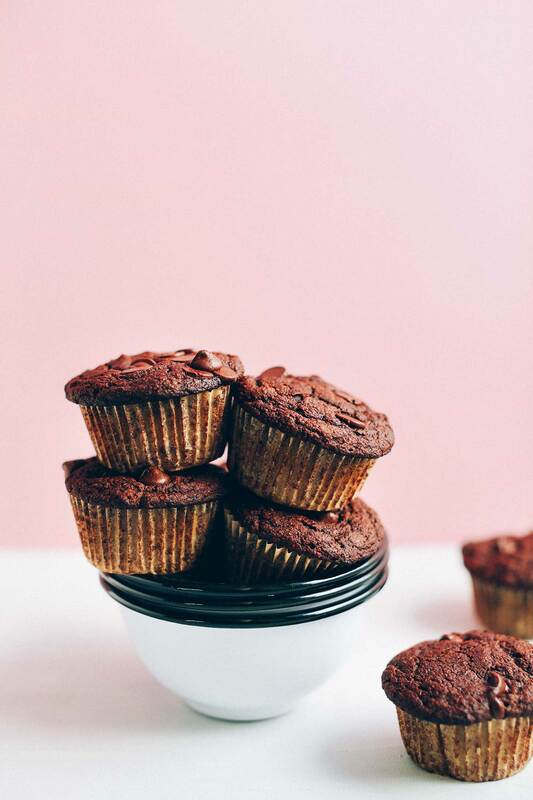 I made these last night and they turned out perfectly – best GF muffins I’ve made yet! I used brown sugar, canola oil and Bob’s Red Mill all purpose GF baking flour. Will definitely be making again. These were absolutely divine! I am not GF so I subbed out the flour with whole wheat pastry flour and for extra oomph I subbed the applesauce for vegan vanilla yogurt! Thanks for sharing your recipe subs, Annie! We are glad you enjoyed these muffins! Have you ever made a bread pudding recipe with some GF bread and coconut milk? I can’t seem to find a recipe for that and I have a lot of end of Loaves I want to get rid off. And I don’t want bread crumbs. Thanks! Hmm, I’ve made bread pudding in our cookbook but it wasn’t GF. However I think it could be! I’ll add it to my list. Hi Maureen! We don’t have one yet but I’ll definitely add it to the recipe request list! Would Bob Red Mill’s Gluten Free 1-to-1 flour work instead of the DIY gluten free flour blend? And if so, do I still need to add the almond and oat flour? I think that should work, but I’d recommend still adding the almond and oat flour. Let us know how it goes! Perfect for brunch. Tastes unhealthy in a good way but I knew they were healthy! I used almond meal that I blitzed a few times in food processor first and grape seed oil in place of coconut. Will definitely be making these again. We are glad you enjoyed them, Shelley! Have made these a few times and they are delightful! Yummy, easy recipe…Love it! Made these with cashew flour instead of almond and the gf flour blend, and with honey instead of maple syrup and sugar. Put 30% more apple. I made these for my 4-year old son but I don’t think he is going to get any as I am eating them all. Thanks so much for the recipe – results are wonderful. Can I make with regular flour if I’m not GF? Do any other ratios need to change for this? Hi Danielle! Yes, another reader had success with using all-purpose flour! If you give it a try, report back on how it goes! Since I don’t have coconut sugar in the house, could I use raw organic sugar instead? I just made these and swapped chia seed for flax and they were delicious!! I’m so excited to have a new go-to muffin that I know my son will love. Thank you so much!! I made these this afternoon and they are DELICIOUS!! I combined the flax eggs in a different bowl so I could let them sit but totally spaced out and had to add them last. It made no difference to the taste of texture and they still turned out beautifully. Thanks for creating such a resilient recipe! This is the best recipe ever! Thank you, thank you so much! I made this muffins and tasted them, after that I felt like in heaven… It so delicious, so good and simple. I made my own millet and almond flour and it was so easy. Made these with 2 chicken eggs, white sugar, and almond meal instead of almond flour. And it was a SUCCESS !!!!! Can I use aquafaba in place of the flax eggs? If so, what is the ratio of 1 flax egg to aquafaba? Thanks! Hi! Yes you can! 3 tbsp of aquafaba to one egg. So for the 2 flax eggs, it would be about (6 tbsp)! I made these with almond butter in place of the coconut oil, they are a new family favorite, thank you! Usually love everything on this site but I am not a fan of these muffins and will not make again. Loved the moisture/density, but despite following the recipe exactly, there were some off flavors that prevented the muffins from satisfying my chocolate muffin/cake craving. I am guessing it was partially due to the use of coconut sugar (maybe date paste would be a better option?). They were also missing that rich chocolate goodness. Maybe melted chocolate would be a good addition (common in most chocolate cake/muffin recipes) and maybe (balsamic?) vinegar to enhance the flavors… Maybe they were just too healthy for what I was looking for given that so many others seemed to really like them! These are AMAZING!! Like so good. Omitted the almond flour because I didnt have any and they still were great. My favorite! Thank you for bringing my food joy back, I seriously wish I could give you a huge hug. You are a miracle worker! mmmmmm….yummy!!!! perfect sweetness for me. I have to admit, I was eating these for breakfast! Made these and they came out great! Kids and adult approved! Any substitutes for all of the sugar containing ingredients. There are numerous scientifically backed studies showing sugar is the main cause of most of our health problems today. Thanks. What a genius way to implement greens into a diet !! To make this non-gf, shall I just substitute all the flower for whole wheat or white and keep the oats? Check the comments as others have tried this! Since we can’t have almonds, would you suggest substituting the almond flour with more oat flour or more GF blend? Thanks! Yes! A blend of the two would be ideal. Let me know how it goes! I made these last night and they came out pretty bitter. It was definitely an error I made but I can’t figure out what it could be. I think my cao is not unsweetened, do you think that could make it bitter? Oh no! Did you happen to leave the sugar or apple sauce out? I made a double batch this weekend because I knew they would not last long with my family. I am sure glad I did because we all enjoyed them. They are so good and rich. I will be making these again soon. Thank you for the recipe! THESE ARE AMAZING! I topped mine with a whole walnut (because why not?). They are super moist and remind me of those chocolate muffins from Costco, but not as sweet or unhealthy. A definite WIN! Also made those 1 bowl banana nut muffins 3 times in 2 weeks #drooling. I made these today with 2 aquafaba “eggs” instead of flax. Delicious!!! I made these last night and they were so delicious! Everyone loved them! Followed the recipe to a T and they were moist and the flavor was so delicious! Looove your recipes! Thank you! ? I just made these using some leftover cake flour, some leftover coconut flour, and almond meal and they are delicious (kind of ugly though… my sweet husband called them “rustic”). Next time I will put some frosting on them or make the batter a bit thinner so they smooth out when cooking. Thank you, Dana, for all the wonderful recipes you share. I haven’t had a bad one yet! SO SO good! I didn’t add maple syrup and decreased the amount of sugar, and they were still delicious and definitely didn’t taste “healthy” ;) Oh, and I used water instead of almond milk, and whole wheat flour. I made these over the weekend and they were awesome! It felt like a guilty pleasure because they taste more like a brownie than a muffin (to me). Thank you so much for sharing! What would be a good substitute for coconut sugar? Any chance more applesauce would work, or maybe date sugar? These are unbelievable. The look on my husband’s face after the first bite was pure joy! – And made into mini muffins – which were done in approx. 17 min. What is Pamela’s gluten free flour blend? It looks like I can’t include a product link here, so just look up Pamela’s gluten free pancake and baking mix. It’s great to have on hand. I store my open bag in the fridge. You can either get it on line or they probably have it at a Whole Foods or co-op near you. It does have baking soda and powder already in it, so sometimes I adjust for that. But mostly it works out great. These look so comforting! Have to try this recipe ASAP! Wow! Divine! So moist. Thanks for the excellent recipe. The only substitutions I made were to substitute light spelt flour for the gluten-free flour and white sugar for the coconut sugar as I didn’t have any in. Again-wow! These are beauties! Made them yesterday using 1/2 cup oat flour, 1/2 cup brown rice flour and 1/3 almond flour. The texture is perfect – light, spongy, crumbly with a slight crusty top. Perfect, Dana, thank you. want to make these asap! how can you sub the applesauce (my mother is fructose intolerant)? Hi! Possibly another fruit puree? Just made these… omg so delicious! I love all of your muffin recipes! They never fail me, even when I make an absurd amount of substitutions because I need chocolate NOW and don’t have all the ingredients on hand. Thanks for another winner! Just made these and they are ahhmazing! Hubby (who is not vegan or g/f) agrees and can’t get enough. Only sub I made was using chia instead of flax seeds (flax intolerance) and it worked like a charm. Thank you!! DELISH. Used almond meal instead of almond flour and they turned out great!! Thanks for the recipe! Because make sirup and coconut sugar costs a lot, what can i use instead? Maple syrup can be subbed with any moist sweetener; honey, concentrated fruit juice, even corn syrup. All of these are pretty cheap, but the fruit juice is by far the most nutritious option. Coconut sugar isn’t much different than cane sugar, or you can use any other dry sweetener including sugar alcohols. Date sugar is the most nutritious option, followed by dark brown sugar (raw or processed). White sugar, brown sugar, or raw sugar sold by an ethnic store are the cheapest. Dates can sub for both, because it has an intermediate moistness, but the flavor can be too much if used all by itself. It’s also not particularly cheap. It is very nutritious though. So, balancing price at the supermarket and nutrition, I’d use concentrated fruit juice and brown sugar. 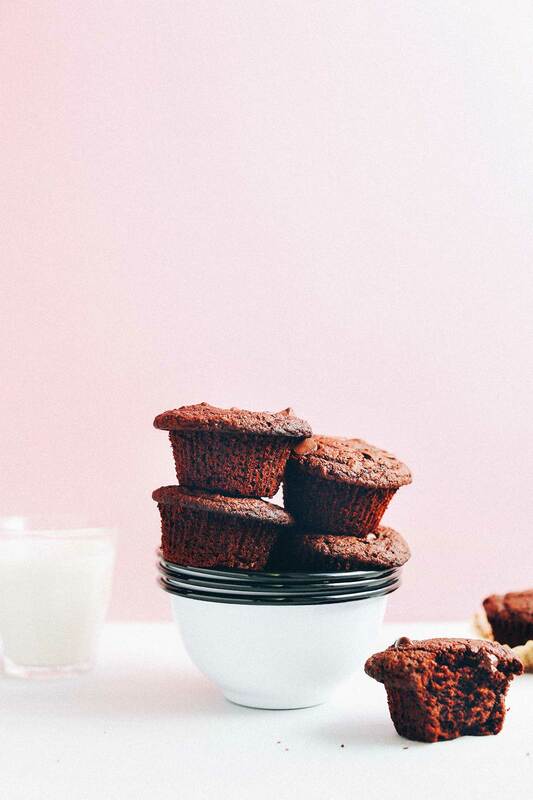 Diving head first into these muffins that really are cupcakes! They turned out so fluffy, moist and absolutely delicious. 10/10 would recommend. By the way the recipe gets 5 stars from me! I am very skeptical about vegan and gluten free baking, as I always seem to mess up recipes and end up throwing out full batches of messed up recipes, wasting ingredients. But I decided to try making these and SUCCESS FINALLY!! These are delicious and amazing and I had no idea V and GF chocolate muffins could taste so good!! They are perfectly moist and fluffy inside, I could eat the entire batch in one sitting! Do you know what I could use as a substitute for maple syrup?? I can’t have sweeteners other than coconut sugar and stevia which is really difficult for a girl with a sweet tooth! Pureed dates. Or concentrated fruit juice. This look delicious! If I am not vegan can I use eggs in place of flax eggs? Hi! Yes! If ever you see a recipe that calls for a flax egg, feel free to use a chicken egg if not vegan! Aw, man this look so good! I love your recipes.. I can’t wait to try it! These photos are to die for!! Heart eyes and swooning all around. Love seeing the texture of the muffins. ?? Oh yay! I’ve been anxiously awaiting these after your post mentioning you needed to try making chocolate chocolate chip muffins! So excited to try these! Omg! Swoon. I saw this recipe and immediately made them. I’m not gluten free so I just 1 1/3 cup of all purpose flour and I also used a chia egg instead. They are lovely!! This is so helpful! Thanks for posting this modification ? Nut allergies here too, wondering if I can sub regular whole wheat flour equally in lieu of all flours? But allergies here too, wondering if I can sub regular whole wheat flour equally in lieu of all flours? I’d also like to know what to substitute for the almond flour and also the applesauce. Food allergies here too. Thanks! For the almond flour perhaps a mix of GF blend and oat flour? And for applesauce another fruit puree? Hi, I’ve tried a number of Dana’s recipes subbing ground pumpkin seeds (pepitas) for the almond meal and any milk for the almond milk. Everything has turned out amazing. My particular fave is the vegan carrot and apple. Good luck! Thank you for this!! Have a nut allergy as well! Have you ever tried to substitute cassava flour for nut flours in her recipes? Hi! In substituting the almond flour perhaps a mix of GF blend and oat flour? Let me know how it goes! I made these this morning and they are amazing! They don’t taste healthy… they taste like cake! Next time, I might add a chocolate frosting to make them dessert and swoon-worthy. I’m not gluten free so I used 1/2 cup AP flour and 1/2 cup oat flour. I’ve been searching for a vegan chocolate chip muffin that include cocoa powder for month with no luck. 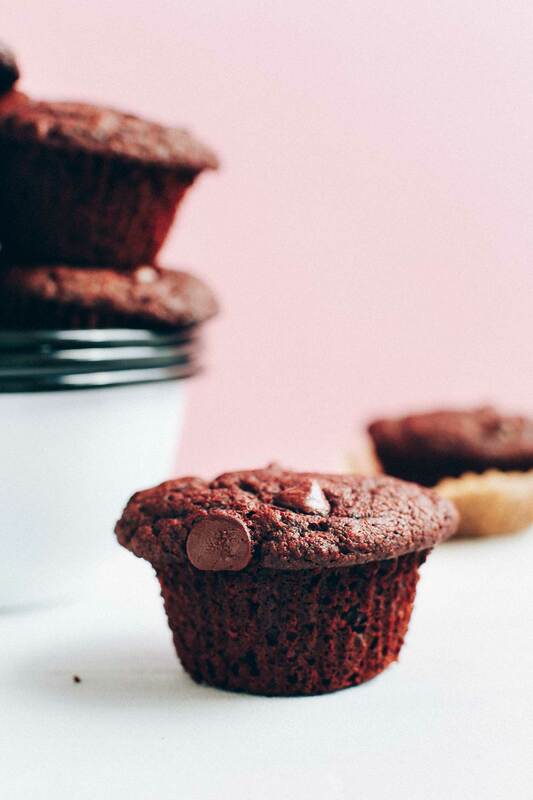 I made the Fudgy Vegan Beet Cupcakes early this week and will make these once they’re gone – – which should be soon! I can’t pin any of your recipes :( tried several browsers (chrome, safari) but it’s not working. Maybe it’s just me though..
Let us know if the issue persists! Hopefully it was just a glitch. I can’t tell you how much I appreciate the effort you take to include gram weight along with your volume measurements for baking. Volume measurements seem to throw off my baking efforts. I have gotten to the point where I will not try a new baking recipe without weight measurements. These look heavenly! I really want to try the vegan carrot and apple ones you listed as well – 2 of my favourite flavours together!